Residential property owners can benefit from solar energy by installing right on their property, usually as a rooftop or ground-mounted system. In fact, the majority of solar installations in the U.S. are on residential properties. Residential solar panel systems are smaller than commercial/industrial or utility-scale solar installations, and the panels themselves are also smaller in size. A typical residential solar system might be in the range of five to 15 kilowatts (kW), but a residential solar system can be however big or small you need it to be, depending on your electricity usage. Residential solar is considered “distributed generation,” meaning that the energy produced by the system is used at or near the point of generation. Residential distributed generation projects like rooftop or ground-mounted solar are typically connected to your local electric grid. This allows for residential property owners to take advantage of net metering, a policy enabling solar customers to send unused electricity back to the grid for a monetary credit. Net metering is a solar incentive that allows you to send excess solar electricity to the grid in exchange for electric bill credits. If you use more electricity in the system than your solar panels generate, you can use these credits to reduce the electricity needed to be purchased from the utility. Net metering allows property owners with solar to take full advantage of the energy produced by their system, as production and usage can vary with seasonality. Residential solar installations: rooftop or ground mounted? A residential solar system is installed either on top of a roof or on the ground. While rooftop systems are far more common, there are advantages to ground-mounted residential solar systems in specific situations. One of the main reasons to install a ground-mounted system is due to a lack of suitable roof space. If your roof is partially shaded, old, damaged, or interrupted with skylights and other obstacles, there may not be space to install enough solar panels to generate a sufficient amount of power. Rooftop installations are more popular for residential solar shoppers for several reasons. For one, rooftop systems don’t use up valuable property space. 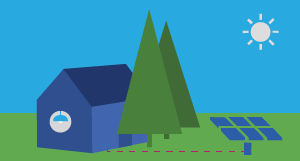 Installing solar panels on roofs uses sunny square footage that is otherwise unused. Rooftop systems are also less expensive than a similarly-sized ground-mounted installation. This is due to the extra mounting and racking equipment required for ground-mounted solar. While rooftop and ground-mounted systems are the most popular types of residential solar installations, there are alternatives. Anywhere the sun hits is a possible spot for a panel installation, and other structures besides a house roof can be outfitted with panels. For residential properties with an ill-suited home roof for solar, there are several other ways to install solar panels. Structures like gazebos, patio covers, and sheds can all be equipped with solar panels without sacrificing any ground space. There may be additional costs associated with non-home roof structures (like extra racking to tilt panels to the correct angle), but if you’re installing on an existing structure, the costs are likely comparable to a standard rooftop solar installation. Of course, if you’re don’t have an existing structure to install these solar panels on top of, the added costs of building a new gazebo or shed to host the solar panels should be factored into your costs and savings projections as you’re considering installing solar. Get competing solar quotes online. See solar prices near you. 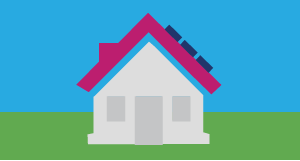 Compare the best offers from solar installers near you. 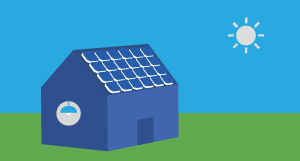 Enter your zip code to find out what typical solar installations cost in your neighborhood.